Denny Jump (Bellevue, WA, United States) on 10 October 2010 in Landscape & Rural and Portfolio. As one of the final concentrated views I will be showing on Joshua Tree's rocks, this is probably a good one to begin with. This is Mammoth Rock and as you can see, the climber has just finished his ascent - but what goes up must come down. Assumming this fellow is about 6 ft tall - the rock face seems to be about 80 - 100 feet high, but I may be way off. I certainly have no plans to measure it first hand!. 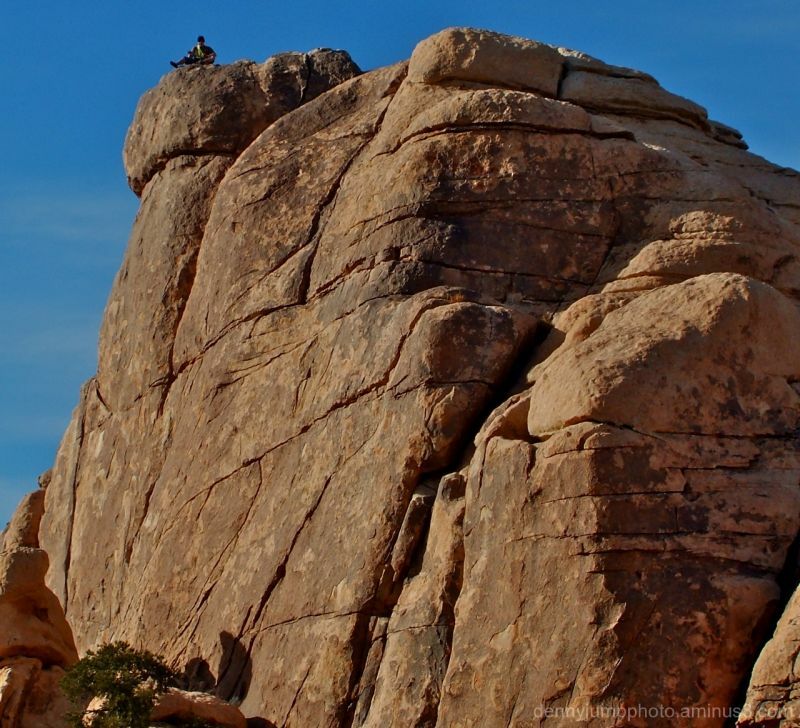 This giant rock facing is just one of many reasons why the park is so popular with climbers, and it is also a great example of the rock development through the ages as well. Great shot! I love the perspective of the man on top. A beautiful view over the rocks! I love Joshua Tree! @Tamara: Hi Tamara Thank you - we are feeling pretty good. I hope you have a great day just like the guy on this rock! What a huge natural architecture! Awesome shot! Aside from the Climber (which I love) the color and the angle of the light are beautiful, and really bring out the incredible texture of the rock! @Tracy: Thanks Tracy..I know, as I was kind of tweaking this I noticed that I must have done something right becasue the texture and cracks in the rock were really showing p nicely...don't you love it when a plan comes together? Like that awesome shot of yours today!! Hilarious with this man on the top . Once again, the perspective of the person is so important to this shot, Denny. You rock (OK, bad pun...). @B. Thomas: Hi Barbara, Thank you very much..I was hoping that folks would forgive me as I felt that it is (was) important to give an idea of the scale in thise huge rocks! Thanks Barbara - have a great week! Cool shot with the climber up there. That is one massive rock. @Steve Rice: Definitely..Thanks very much Stev =loved your shot today..really unique find! Great POV! The man on top definitely provides a sense of the size of this rock. Light here is just about perfect. Nicely done. @Formerly Known as MontereyJohn: Hey John1 Thank you so much! That's a biggie! wow! And he looks to be about an inch tall. really great! @Becky: It is a HUGE rock for sure...Thanks Beckie...I hope you gus are doing well....All the Best! Excellent with the presence on top that gives the (big) scale ! What a place, impressive. Have a great week, dear Denny. @k@: HI Karine - Thank you very much and I love your image today..really wonderful. I hope you have a great week as well! Nice sense of scale here. Thanks for the info about the rock. So this is granite too? @Marilla: Hi Marilla - Thank you so much! I also love your water image - that is wonderful!! The climber really helps establish scale here and demonstrates the rock's enormity. Great textures and color. @Steven: It's a Big Rock Candy Mountain for sure!! Thanks Steven!! That is either one brave or one stupid man lol! Better him than I! Great shot!